Diablo III was an average game, damned by years of anticipation and mediocre game design. Fans of the franchise wanted to love it – and we did our best – but issues like the Auction House fiasco, lousy itemization, and uninventive gameplay left us hungering for better. The game left us bitter; almost two years later, some former players still refuse to speak about it. But Blizzard didn’t abandon the community: it marched forward through the great flickering flames and bitter poison with hope – hope that came in the name of Death. 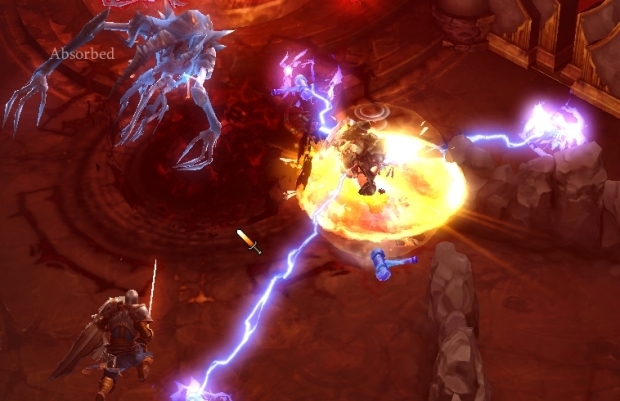 This week has marked the release of Reaper of Souls, Diablo III’s first expansion. With it comes a new Act, a new class, a new game mode, and a new artisan. But can these four presents, bundled in a monochrome package, redeem Diablo III? Taking a similar approach to its World of Warcraft expansion releases, Blizzard released a free update to Diablo III a few weeks prior to Reaper of Souls’ official debut. This patch wasn’t simply a preview of things to come: it was a fundamental change in Diablo III’s gameplay that becomes necessary to discuss, in brief, before looking at the meat of the actual expansion. Itemization is the most crucial change to come with Diablo III’s new patch, so much so that the update is often referred to as Loot 2.0. The changes, intended to address the issue of dismal drop rates, disappointing item stats, and the dreaded Auction House, have made a remarkable impact on the game. A new Smart Drop system means that most loot will roll stats based on the class that is being played, making upgrades far more common; meanwhile new item properties and stat ranges have made these upgrades more meaningful. 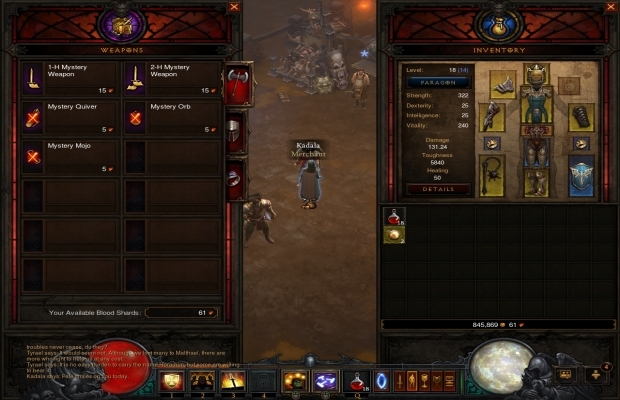 As a final blow to the achingly slow gear progression of the original Diablo III that forced players into trading for better loot, all legendary and set items were made bind on account, and the Auction House system was shut down on March 18. In short, loot is now something to look forward to and work toward finding. The second major change worth noting is a revision to the Paragon system, Blizzard’s initial answer to end-game progression. Paragon levels are now account bound and without level cap, offering points evenly through four categories: Core, Offense, Defense, and Utility. Each character may opt for different bonuses, like opting for critical hit chance instead of attack speed. While the new system strips itself of magic find (which is of less concern with the changes to itemization), paragon levels also become far more interesting and useful to characters. It also adds some extra incentive to keep leveling at end game. The last of the major trio is a change to the difficulty system. Enemies now scale to your level (regardless of act or difficulty), and all difficulties have been retuned. Changing difficulties is easier, and the ultimate difficulty mode – now called Torment – has a slider that allows for further adjustment. The Diablo III update also sees host to dozens of other changes, from new buffs and quest rewards to the introduction of clans and communities. There are also hundreds of tweaks across the board to all classes. I’ll leave you to your hours of research and theorycrafting later: let’s talk about Death. 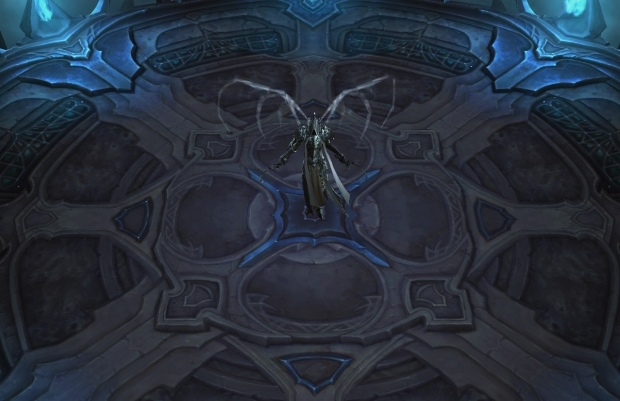 Reaper of Souls is titled after its grand villain: Malthael, the Angel of Death. Malthael claims the Black Soulstone, and so the nephalem has been called back to duty to save humanity from Malthael’s mysterious plans. While the nephalem’s work begins in the town of Westmarch, they will eventually move on to other areas in order to undo Malthael and place the Black Soulstone back into the hands of those it may be trusted with. This is the setting for the fifth chapter (Act V) of Diablo III, and while the storyline follows no great twists or turns, it is a satisfying epilogue to the game’s original story. The writers remained responsible storytellers as they brought stray ends to a proper conclusion and left the door wide open for a new Diablo story (be it expansion or Diablo IV), but there’s more to Act V than this. 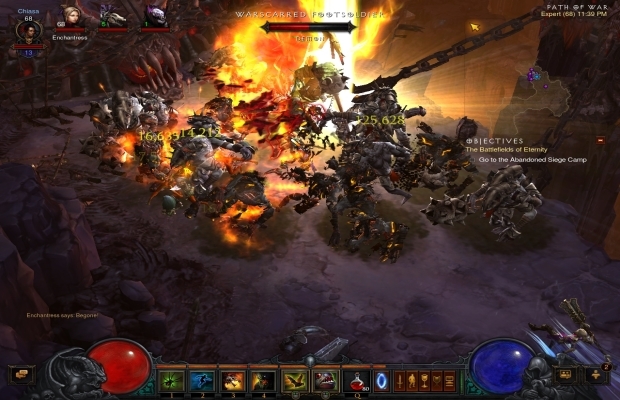 Westmarch has its own storyline that runs concurrently with the main story’s events, and there are nods to other portions of the game’s lore, such as Leoric’s invasion of Westmarch. It is worth the spare time to explore extra areas and discover lore objects to see the full story of Diablo III realized. Each follower now has their own separate side quest available to complete, bringing some resolution to their woeful tales. A few moments in the story also offer some epic action – the battering ram is just plain awesome. Act V’s storyline also comes with one more surprise: each class has its own slight twist to the game’s story and ending, offering a more immersive experience and bringing that trickle of each class’s backstory to a conclusion. Act V also deviates a little from its predecessors in gameplay. New environmental challenges have been introduced to offer an additional threat from new enemies. Bosses, in particular, have been designed to offer greater challenges that have many cursing and even lowering difficulty to get by. I spent at least a half hour hating the second boss – imagine Frogger and then multiply and twist it into a maze of bloody goo – and at least as much time restrategizing for the final boss, whose challenges are a nod to “bullet hell” shoot ‘em ups. These new challenges will, of course, become routine over time, but have demonstrated that Diablo can be more than bulldozing mindlessly through demons. The Order of Zakarum has not had the brightest of history, and yet, the Crusaders march on, hoping to one day cleanse Zakarum of corruption. So it is that Diablo III has been graced with the presence of paladins in the form of the new Crusader class. Crusaders are heavily armored warriors that utilize the Light to defend, heal, and attack. Their resource is Wrath, which works similar to the Monk’s Spirit – a generated resource that gains, rather than depletes, over time; favored weapons are flails and shields. 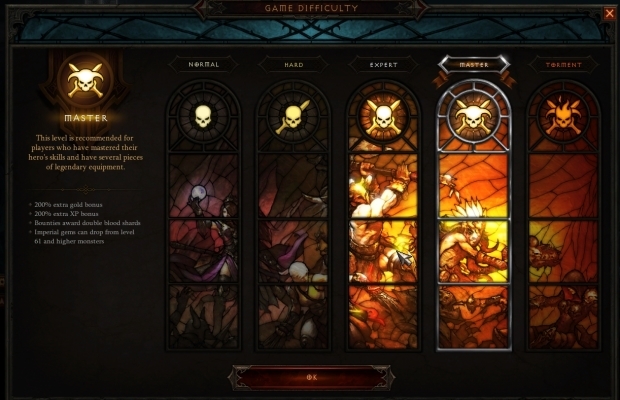 Defining the Crusader’s role in Diablo III is trickier. As described, Crusaders sound like the ultimate tanks, and yet they do not benefit from the damage reduction that Barbarians and Monks do; in fact, they struggle with the ineffectiveness of block against certain damage types. In fact, Crusaders may seem more effective as medium range DPS, with skills that reach out across the screen and offer some hefty damage. The possibility also exists for Crusaders to become an excellent support class, with powerful heals and buffs for allies. The Crusader is a young class. Only a few days past launch, only a few have started entering Torment and gearing their Crusader; most are still leveling or struggling in finding working builds. Blizzard also issued some major changes to the Crusader as Reaper of Souls launched, nerfing some cooldown skills into oblivion (alas, Steed Charge, we hardly rode ye). Some mechanics – such as a painful 15% movement speed reduction in order to use a two handed weapon as a one-handed weapon – are outright questionable. Crusaders seem to have inherited Monk’s previous problem with useful spenders, and careful cooldown management is key. It’s likely that we’ll see Crusader tailored in the next few weeks as more feedback comes from the community, but the simple verdict is that the Crusader is an equally functional class to its peers, and will appeal to most players interested in a more defensive attacker. Veteran Diablo and Diablo II players are all too familiar with the end-game grind. Option one: pick a difficulty mode, run it through on story, and rinse/repeat until you’re max level and have the best gear. Option two: grind specific areas or bosses with a high magic find and hope for that legendary you know is out there. Option three: get tired of it all, buy the gear you want from someone else, and call it a good day. It’s not pretty, but it is the Diablo end-game formula: rinse and repeat until you’re blue in the face. Curiously similar to MMO end games, isn’t it? Nevertheless, Reaper of Souls has introduced a new method to alleviate the potential boredom at max level: Adventure Mode. This mode is a little like a post-game sandbox: all story quests have been stripped and all waypoints have been activated. Instead, you have two gameplay options: Bounties and Nephalem Rifts. 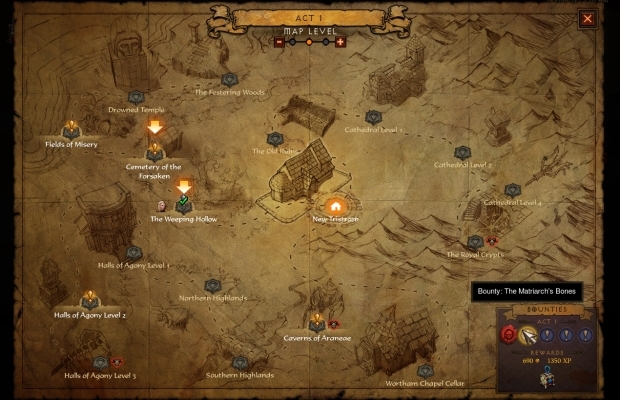 At the start of a new Adventure Mode, each Act has five bounties, visible on the world map. These are short quests which have a few possible options: clearing a dungeon, completing a map event, killing Unique Monsters (purples), or killing a story boss. Unique kill quests are also tasked with killing a set number of monsters in the area (usually 100). Since waypoints are open, and objective arrows will point you when you’re close, most bounties can be completed quickly. Each Bounty awards experience and gold on its completion, and completing all Act bounties grants you extra experience, gold, and a Horadric Chest. This last item is a special chest that may contain rares, exclusive legendaries, crafting materials, and Adventure-Mode items. Two acts will also have bonuses, making it even more worthwhile to clear these acts when playing. However, clearing all the Acts offers no bonus; it often becomes more worthwhile to simply start anew rather than stick it through. Nephalem Rifts, on the other hand, must be unlocked through the use of Rift Keystone Fragments, items which may be rewarded from completing Bounties. 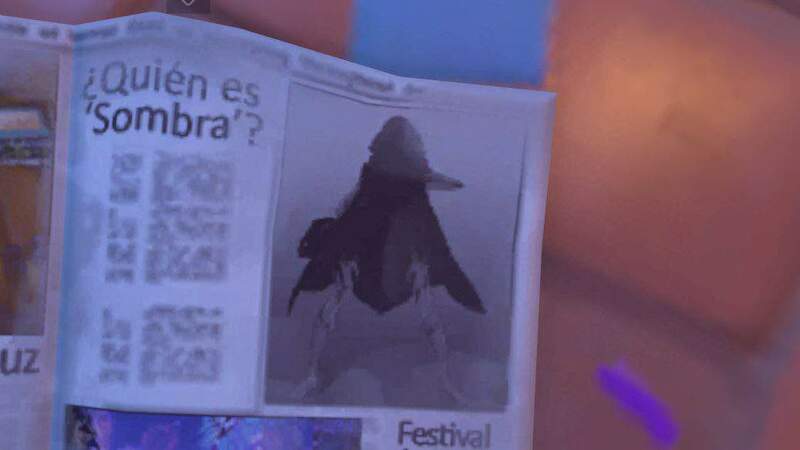 Five of these keystones may be consumed to open up a Rift. Rifts are completely randomly generated from the game’s existing assets, and task the player to do two things: kill enough enemies to summon the Rift Guardian, and then defeat the Rift Guardian. These are completely procedurally generated: the environments, challenges, and monsters are all randomly selected on each level. This means some levels of a Rift may be particularly challenging depending on the combination you’ve rolled. These areas take longer to complete than bounties, running about a ten minute average, but offer experience, gold, and rare loot drops from the final Guardian. One final component of Adventure Mode is a unique currency called Blood Shards. These account-shared items may only be used at one merchant: Kadala, the daughter of Gheed from Diablo II. 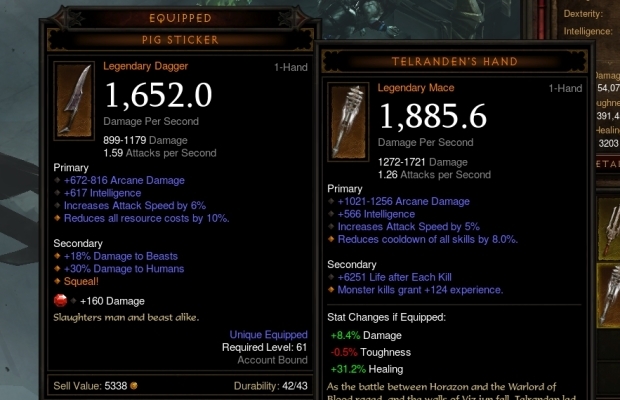 Gambling has returned to Diablo in a bitter sweet way; bitter, as the luck of the dice is just as cruel, but sweetened by the fact you won’t run your actual gold reserves dry. 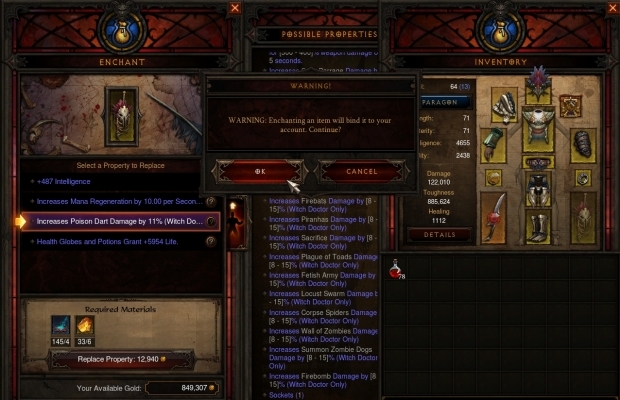 Kadala’s items are relatively cheap, but most are nothing more than salvage fodder; in fact, you’re likely to find better items simply plodding through in your destruction of evil than bargaining shards for mystery loot. A much better use of blood shards would be for the purchase of crafting materials, particularly rare legendary mats that can require hours of boss runs to collect. This last system is where Adventure Mode fails. Bounties and Nephalem Rifts are a fun way to level and gear up at any level, even without a bonus for completing bounties in all five Acts. It’s a new way of looking at the game, and a way of hitting the interesting content without going through the story on repeat. Blood Shards, however, should be the icing on the cake; instead, they’re dried out, stale crumbs. The last of Reaper of Souls’ features – but not the least – is the Mystic, a new Artisan unlocked in Act V’s story mode. 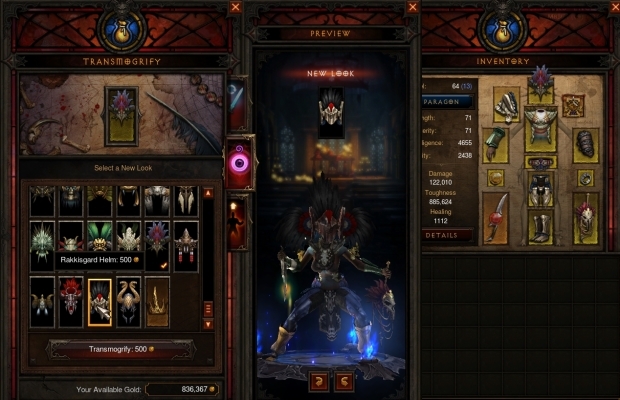 Originally designed for the release of the original Diablo III, the Mystic was eventually pulled from the design roster for redundancy, but has now returned with two major functions: transmogrification and item enchantment. Blizzard couldn’t help but consider bringing the popular transmogrification system from World of Warcraft into Diablo III, but thankfully, the Mystic’s system is far less frustrating. The basis of the system is simply to change the appearance of your current gear to that of other items. There’s no need to store appearances in your Stash; Myriam catalogues all basic appearances along with any Legendary Items you discover. Basic appearances cost a paltry 500 gold, while rare appearances cost a heftier 50,000 gold each. This is a nice system to allow players to have a more unified appearance, but will see little use for most until they are max level and hunting down the last of their gear. Item enchantment, on the other hand, is a more complicated and costly beast. Here, Myriam can change out a single affix on an item for another. There is limited choice in how enchanting works: while you can select any property, it may only be replaced by a random property from a given list that the Mystic will show you before you choose. Additionally, once you’ve chosen a property and rerolled it, you’ll never be able to change out any other properties on the item. The process also requires a payment plus the cost of appropriate crafting materials, making it an expensive way to fine tune gear for your playstyle. While enchanting offers some way to make a good item better, you simply can’t create the perfect item by brute magical force. 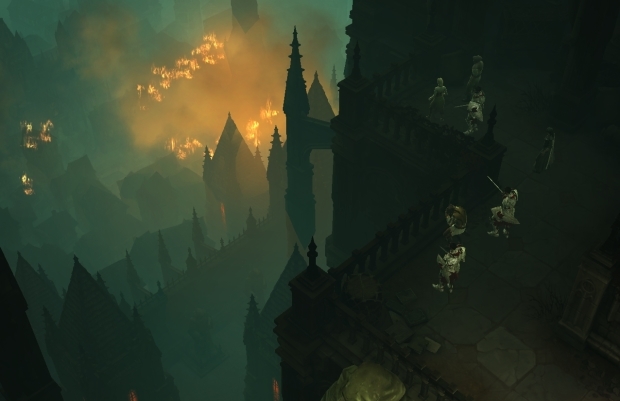 Diablo III has evolved from its mediocre start to a great game. 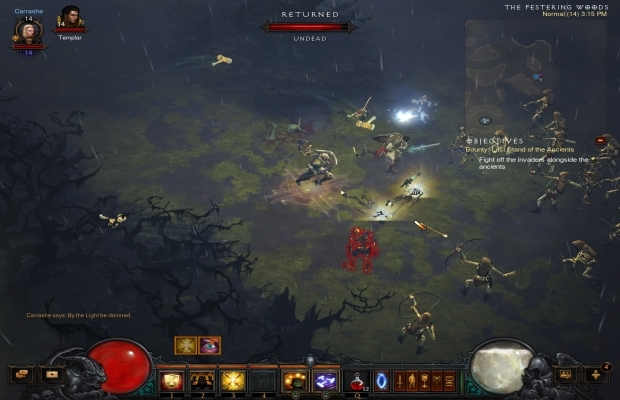 The entire polish to loot, paragon systems, difficulty, end-game content, and customization make for a wholly redesigned Diablo III. Players have returned with enthusiasm, some even forgiving the past mistakes. 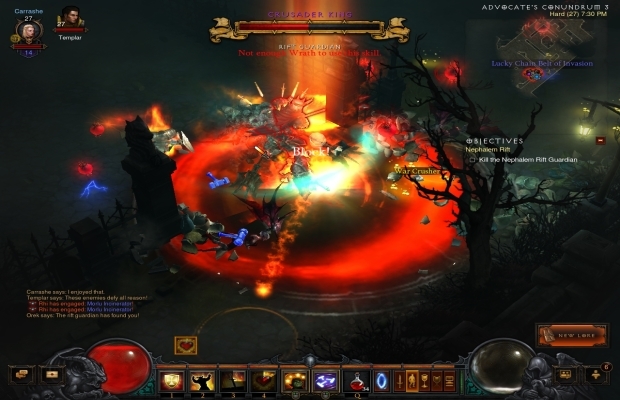 Diablo III 2.0 was an impressive success that gave life back to the franchise. However, a great deal of Diablo III’s rediscovered glory has come not from Reaper of Souls, but from its free pre-expansion update, and our verdict has to look crucially at what the expansion itself has done for the game. So how does it sum up? Reaper of Souls offers a fantastic storyline to satisfy the lore-hungry. The Crusader is a confused class at release, torn between its chance to be the devastating holy tank its packaging touts, and the mid-ranged damage dealer that its skills support. The Adventure System is a breath of fresh air into a stale ARPG that has long deserved truly random encounters, but trips over a poorly designed return of gambling. And the Mystic, while useful, feels like the littlest Artisan, only incidentally useful until end game. Meanwhile, Blizzard was still unable to find a way to make a proper PvP mode for Reaper of Souls, and so the promise of PvP looms like political propaganda over the title. In short, Reaper of Souls delivers good content, but it remains flawed. Some flaws, like the inevitable loot grind or heavy battle against RNG, may be forgiven as flaws of the ARPG genre itself. We may see them change in a new iteration of Diablo IV, but asking Diablo III for a complete game redesign is unreasonable. On the other hand, the new content is lukewarm, as if the development team was still demoralized by Diablo III’s initial struggles. 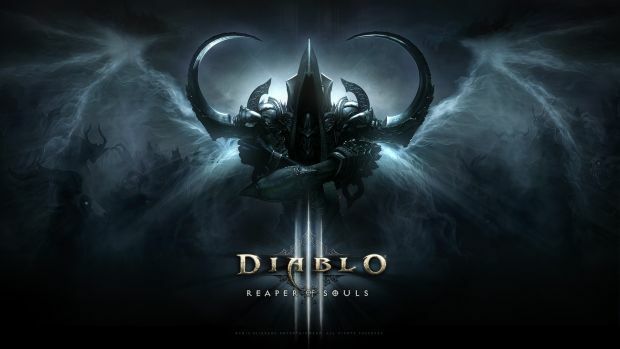 Combined with the 2.0 update, Diablo III is a game worth returning to, fun and infuriating as all ARPGs should be, but Reaper of Souls simply falls short of true excellence. Diablo 3: Patch 2.4.2 is live!